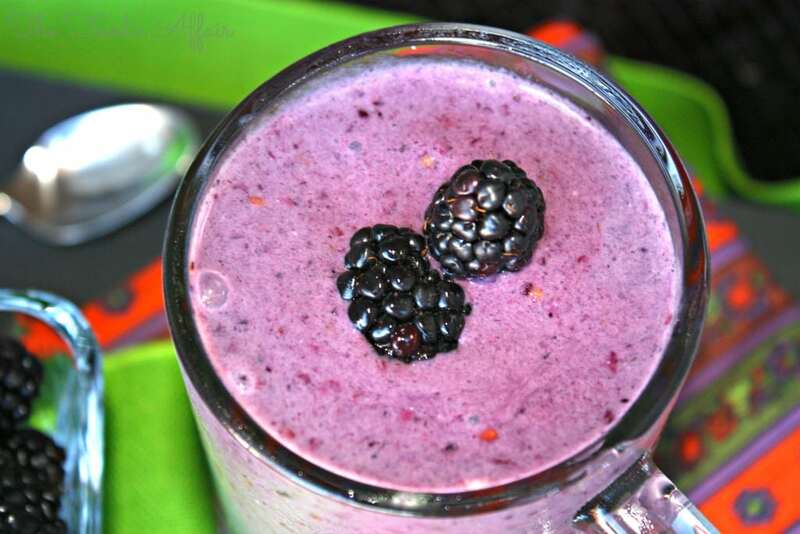 Quick and easy to make, this Blackberry-Banana Smoothie is a great on the go breakfast, snack or post workout drink! 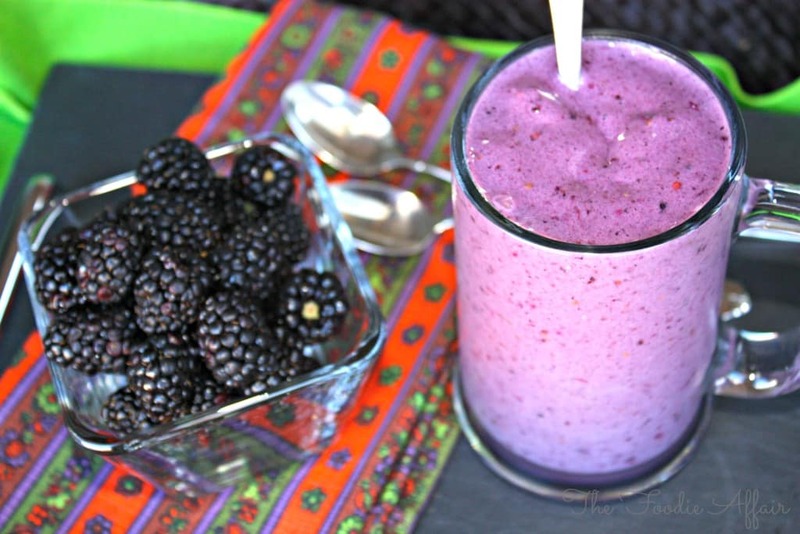 Time to get back on track with a tasty smoothie! If we’re friends on Facebook, then you’ve seen my on-the-go smoothies that I blend up before I bolt out the door, and head to work. I like to experiment with different liquids; coconut milk, almond milk, and coconut water. I also throw in veggies like kale & spinach, and various fruit combinations. 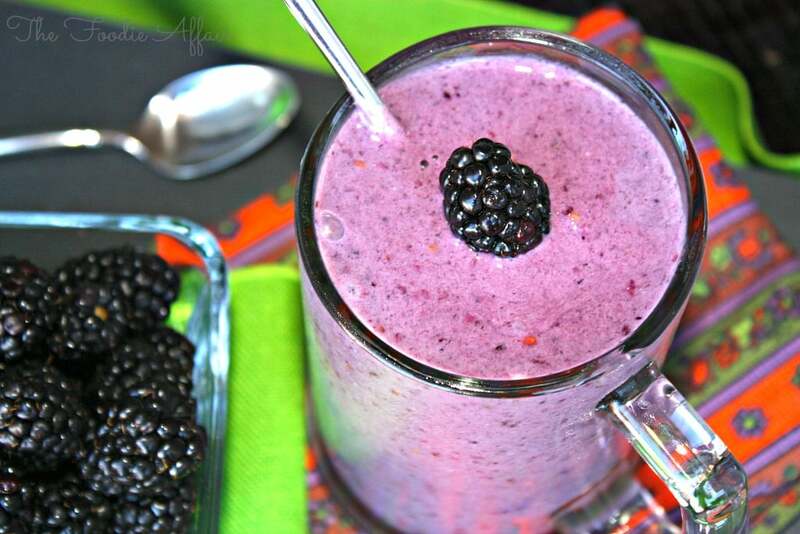 Did I already share this Blackberry-Banana Smoothie with you on Facebook? I may have, since the combination is delicious, and blackberries are stocked along with bananas in my freezer. As I experiment with different ingredients, I’m finding that if I pair a protein with a carbohydrate, and try to match their nutritional grams as close as possible, I’m satisfied longer and my energy doesn’t take a nose dive, but it’s a little challenging to keep the gram counts even. The protein portion is easy to calculate, since I add protein with plain Greek yogurt or whey protein powder, and the details are listed on the packaging. The carbohydrate portion is a little harder to balance, because fruit is so delicious, and I want to keep adding more and more, but that means the carb count can get out of whack, so I’m trying to be mindful of how much fruit I include to keep the protein/carb ratio as close as possible, and more importantly, I want the smoothie to taste fantastic! I calculated this smoothie at 24 grams of protein and about 30 grams of carbohydrates (your counts will differ, depending on the brand of protein you use). See how quickly the carbs add up?! It’s those darn delicious bananas that kick up the count, but they are so perfect for thickening a smoothie!! This kept me satisfied for a good four hours! My tummy was happy and didn’t feel like I needed a snack before I had lunch! Add almond milk (or liquid of your choice), protein powder and fruits to a blender and pulse until ingredients are well blended. 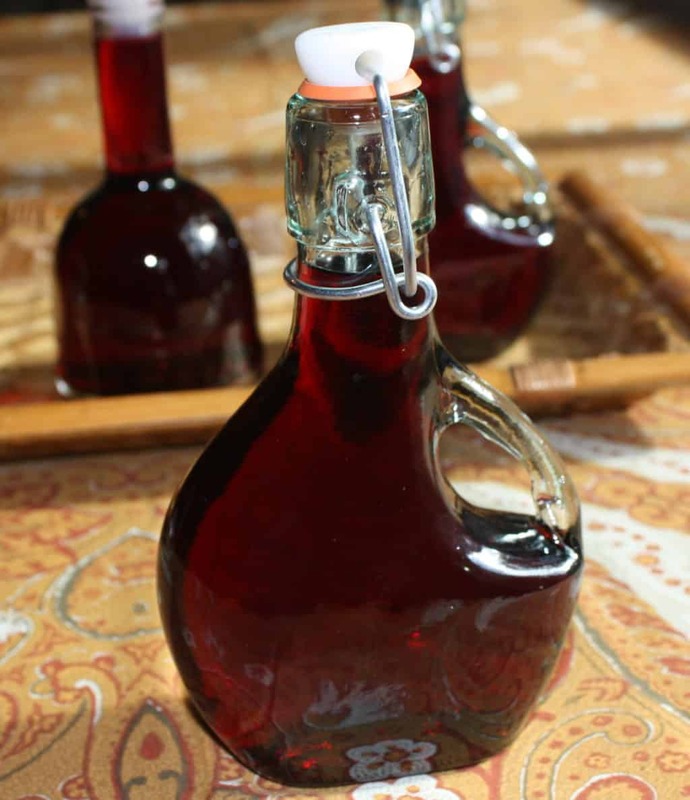 If you used fresh fruits, add ice if you want a thicker beverage. Have you tried my yogurt based strawberry smoothie ? 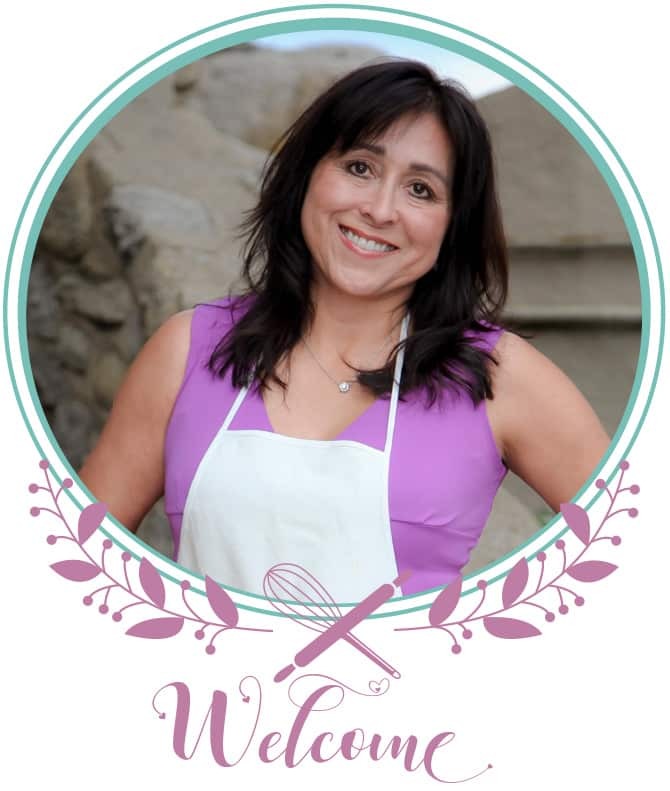 You may also like a mixed Berry Smoothie from Wine Lady Cooks! Celebrations for our fishes 🙂 I love the dark specks from the berries! 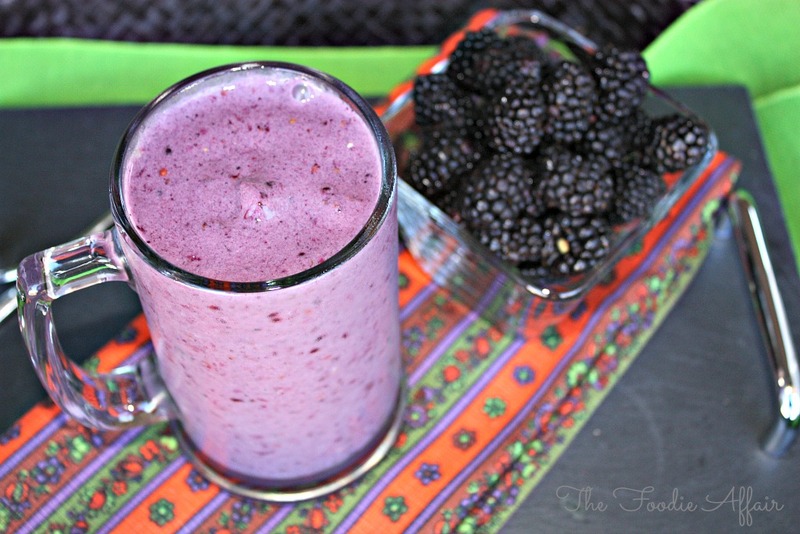 Just love the color of that smoothie! Happy B-day to your daughter. I did see this post maybe on Facebook. However, it looks so much bright and wonderful viewing it on your blog. I would love one of those for breakfast today. Sammy! Anytime I find a sale, I buy several containers and freeze them for later. I love them!! 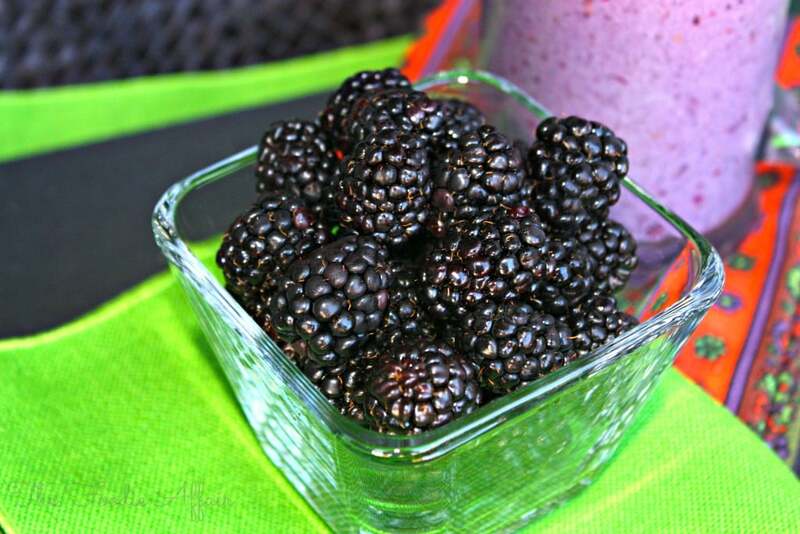 Blackberries are about to go out of season here, so, I can’t wait to try this wonderful recipe.